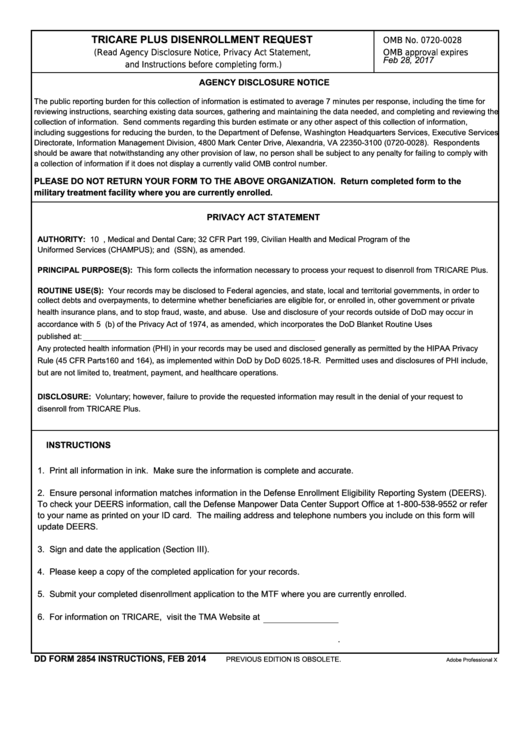 Download a blank fillable Dd Form 2854 - Tricare Plus Disenrollment Request in PDF format just by clicking the "DOWNLOAD PDF" button. Complete Dd Form 2854 - Tricare Plus Disenrollment Request with your personal data - all interactive fields are highlighted in places where you should type, access drop-down lists or select multiple-choice options. military treatment facility where you are currently enrolled. Uniformed Services (CHAMPUS); and E.O. 9397 (SSN), as amended. PRINCIPAL PURPOSE(S): This form collects the information necessary to process your request to disenroll from TRICARE Plus. but are not limited to, treatment, payment, and healthcare operations. 1. Print all information in ink. Make sure the information is complete and accurate. 2. Ensure personal information matches information in the Defense Enrollment Eligibility Reporting System (DEERS). 3. Sign and date the application (Section III). 4. Please keep a copy of the completed application for your records. 5. Submit your completed disenrollment application to the MTF where you are currently enrolled.